A gate is any temporary barrier between a player and progress in a game, generally they’re used to give a moment of breathing space between encounters that demand more from a player, but they’re an incredibly flexible tool in a level designer’s arsenal. I’ll go over some of the common types of gates with a few examples from Half Life 2 Episodes One and Two. This type of gate prevents a player from leaving an area without a key item that they’re going to need. If you’ve just given the player a super gun, or a key card he’s going to need later, you’ll want to make sure he’s got it with him before letting him continue. As with every type of gate there are many ways to ensure the player has what is needed before letting him continue, the most obvious being: getting him to use what he needs in order to get out. These commonly happen when the player gets a new type of weapon, in the first moments of Episode One you’re stuck in a pit until you get hold of the gravity gun and you can only get out once you figure out (or remember) how to use it. Thus ensuring all players can only progress once a basic mechanic has been learnt. Later on in EP1, when you get your first pistol there is a chain link door blocking your way that has been padlocked shut. A player who failed to see the pistol will try in vain to use the gravgun to blast the padlock open and find it impossible and be forced to search for an alternative. The player who picked up the pistol though will realise quickly that it needs to be shot open. Simple, but 100% successful at ensuring the player has a pistol. Pistol? Check. No player will ever leave this room if he can't find the pistol. A dead zombie slumped in the corner provides a reminder of how important finding the pistol is. The emotional/story gate is next up on the importance list. All gates provide a bit of breathing space but this type is there specifically to add much more of a pause in action, typically a door or obstacle that only an NPC character like Alyx or Barney. Just after the stalker car train crash in Episode One, both you and Alyx scramble into a small room, the only exit is blocked by a combine force field. Alyx slumps against a wall and delivers a minute or two of emotional catch up along with a bit of a story reminder just in case you got a bit carried away and forgot that the citadel is about to explode whilst you’re still under it. Both important features of immersion and keeping the player fully absorbed into the universe you’re creating around them. 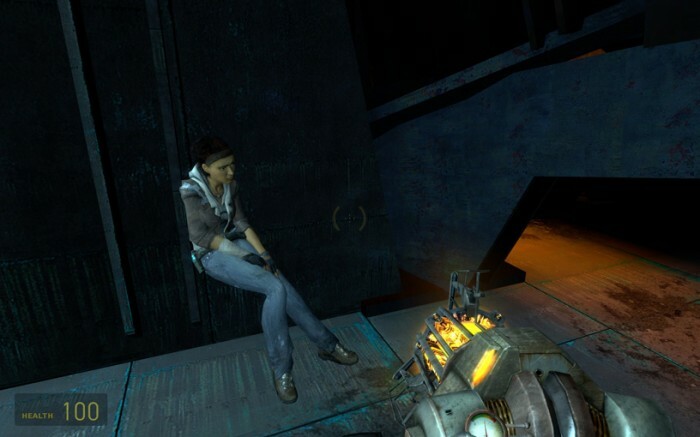 Alyx's actions constantly remind the player what is going on, She's often a pillar of courage but sometimes even Alyx needs time to come to terms with what is happening. Yes, that was a train crash you were just in, and yes those are people post-mutilation. Sometimes you just need to stop and admire the view. Some times you need to beat players with a stick to get them to admire the view you’ve created for them. Fortunately though its often not that difficult. You’re inside the Citadel, everything is falling apart and you’re in a rush to get to the core. You turn and suddenly a huge expanse opens in front of you, do you look? No, of course you don’t, the Citadel is about to explode. But a knee high barrier you can easily jump over is enough of a visual cue to stop you from instantly seeing the way forward, then combine that with Alyx’s ‘Whoa’ and all of a sudden you’re willing to spend a few minutes to look around. One of Episode Two’s best vistas is blocked off in an even more feeble manner, the Combine infested bridge being your first view of daylight after the antlion tunnels would be an obvious point to stop and admire the country side. In the commentaries though it is reported that players managed to miss the scene between Alyx and the Vortigaunt that unfolded. By placing a few barrels blocking the exit players paused long enough for the scene to start and for them to realise they should stay and listen. Three barrels is sometimes all it takes. The first time you encounter something new there will probably be a gate making sure you’ve actually witnessed the introduction. Sometimes, like this example, the introduction actually is the gate. 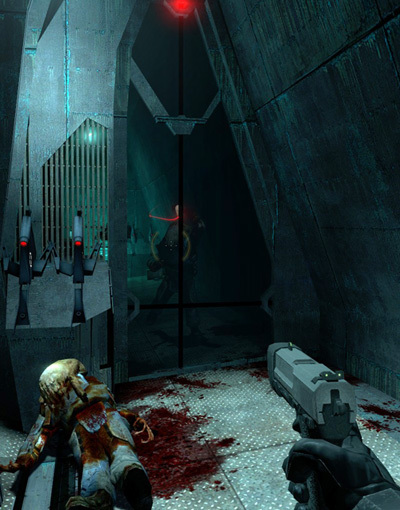 Here the player is introduced to a new enemy in a safe way. It manages to pause between to chunks of action, provide comic relief as well as teaching the player about the zombines that become a key enemy of Episodes One and Two. Tutorial gates can teach the player anything, sometimes an NPC will allow you to leave once you’ve completed X task at least once, like Dr Magnuson when he’s teaching you about how to use his Magnuson devices on striders. Other times the gate opens itself like the zombine gate or the gate might be one you have to open yourself. A Multi-purpose gate in action, providing a bit of comic relief 'Zombines, get it? ', teaching players zombines grab grenades when close as well as providing a breather in between action. Most gates aren’t one type of gate combining purposes can make the gate far more interesting and help to engage players with NPC characters that they might just be ignoring otherwise. All of the gates I’ve mentioned here are combinations of the key fundamental aims of a gate: Pause in action, lesson, got everything? and emotional/story developments. They key to a good gate is for the player to not even realise they’re being halted deliberately. With pacing that flows and no abrupt changes Episode One alone sneakily managed to fit in around 35 to 40 gates! This entry was posted on Monday, February 22nd, 2010 at 3:08 PM	and is filed under Articles. You can follow any responses to this entry through the RSS 2.0 feed. You can leave a response, or trackback from your own site. Informative post in controlling the player and game flow. In the first scene in Episode 4 there are 4 “gates” all in quick succession that perform most of these tasks. When Alyx rips off the train door with the grav gun to let you out. This forces you to listen to Alyx’s dailogue and emotional response to the resent events. It also re-introduces you to the gravity guns function. When you grab the gun off alyx, to push open the cargo container doors open, which is a ‘lesson gate’. When a fence blocks the next path out of the train crash scene, forcing you to look at the portal storm from the cliff edge, to admire the scene. Which then triggers a portal storm causing the bridge to fall and open the previously fenced off pathway into the caverns. 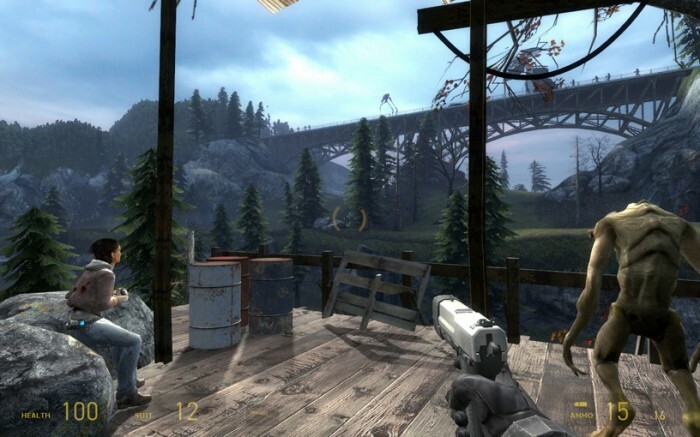 The falling bridge focuses attention to the newly acquired “gate”, and Alyx’s dialogue also cue’s your attention, since this route was previously inaccessable. Episode 4? Ha ha. I meant Episode 2.
episode 4? when did this happen!! this is the core mechanic of most adventure games, the first one coming to my mind being The Legend of Zelda. The basics of EVERY zelda game, starting with the first one is: (1) explore the area you are limited to. (2) find the weapon you need in order to escape the area (3) find the gate that your new weapon will let you bypass (4) repeat. I read an article about it… but i can’t find it. it was very similar. Chickenm4n, the mechanics used in Zelda games might be the same when you strip them down but the gates in room-based games like Zelda are very different from the gates in more linear FPS games, in your average Zelda dungeon you know that you’re going to be trapped in a room until you’ve completed it’s task but the purpose of the gates in Half Life are far more subtle. They’re there to ensure the player has done everything he needs to before he can leave much more passively, the player almost shouldn’t realise most gates are there. I engines other than Source, some games use gates as a way of “removing” load times, by removing from memory the area behind the player, and loading the next one. I believe Metroid Prime uses this extensively, although some load times did get a bit long when the player wasn’t otherwise distracted whilst waiting for the door to open. absolutely, i understand. I was just correlating a core mechanic that is in most video games. in l4d(2) can crescendo events be used as gates? Firestorm you’ve failed to grasp the concept of a gate. A gate is not the event, just the blockade preventing a player from leaving too early. The crescendo is an event in its own right, but would be skippable (if it wasn’t for the massive zombie hoard trying to maul your face off). i think you misunderstood me. what i mean by using a crescendo event as a gate is that the point that the crescendo event is at is an important point, because it’s on top of a hill, and it lets people see what lies ahead, and possibly even pick off a few zombies. It is an elevator, and activating it calls the horde until the elevator arrives at the top of the hill, which is where the players are. The fact that starting the event calls the horde was what I was thinking could be used as a gate, because players will want to make sure they have scavenged everything they can from the hilltop, and it also would give players a chance to see and shoot at what’s ahead. I suppose it would be like a combination of the0 “did you get what you needed” gate, and the “sight-seeing” gate. so, bearing that in mind, would a crescendo event be similar to a gate in that circumstance? Firestorm is right. I don’t think a crescendo event itself is a gate, since it’s not a pause in gameplay (indeed, it’s the opposite of pausing!). But the period before the event is always calm, where players can wander around, get ammo and weapons, and formulate strategies with their teammates – this is certainly a gate. Calling an elevator, opening a door with an alarm, or turning on the Burger Tank sign are all serve to open the gate and continue the gameplay. I think that brings up an important distinction between single-player gates and multi-player gates. 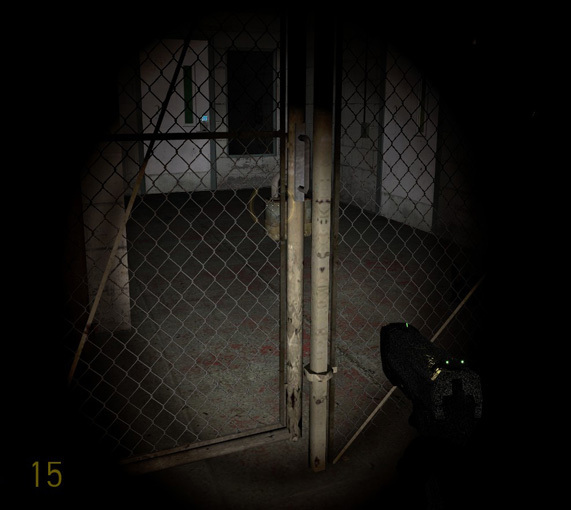 The gates in L4D or Team Fortress 2 usually don’t care if you’ve got the correct weapons or heard a bit of story – they only require you to understand to “Call the radio – be ready to fight the horde”. It’s much faster and therefore requires a different type of gate design, which might be for another article entirely. I’m all too familiar with the first type of gate from LucasArts adventure games. They use them all the time to let the game give you an item you will need for a much later puzzle, rather than having to provide all the items you need right where the puzzle is and thus making the solution too obvious (and allowing you to use items you normally wouldn’t find in that environment). Like the fire extinguisher in Grim Fandango; you never really need it until you’re in the Petrified Forest, but there’s a scene much earlier on when the game makes you try to use it, to make sure you have it in your inventory by the time you’ve left the city. I never thought about FPS games using them before, but now that I think about it, they totally do. Bioshock has a couple plasmids you need to equip in order to progress through the level. They’re not strictly necessary ever again, but it’s hard to get by in the game without them and they’re only available in that one place you find them. And of course the wrench, which you need to use to smash open a collapsed doorway before you meet your first enemy. FPS games in general seem to like forcing you to use your first weapon before you encounter any baddies.